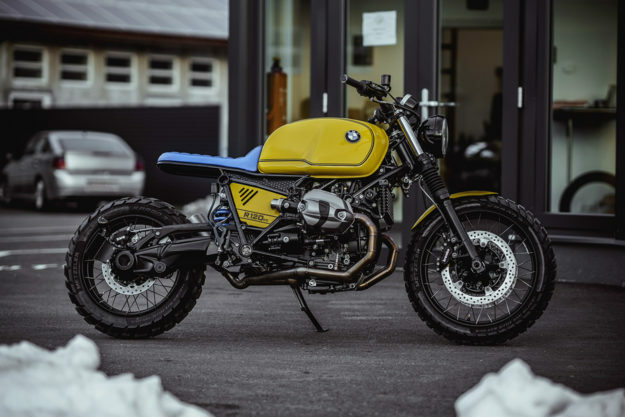 It seems like the Austrian outfit NCT Motorcycles can do no wrong. 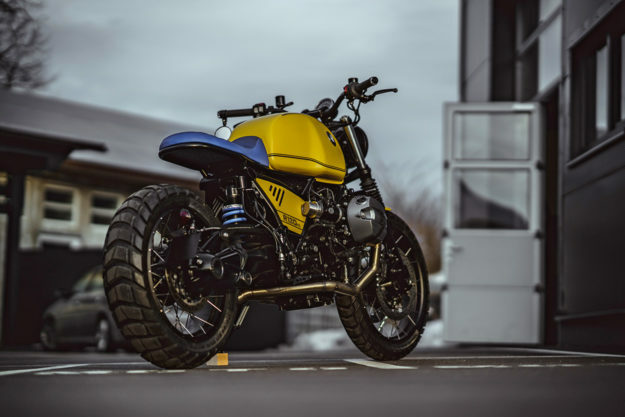 Since they exploded onto the custom scene a little under a year ago, they’ve churned out hit after hit—sprinkling their magic over anything from vintage Guzzis to modern Ducati sportbikes. 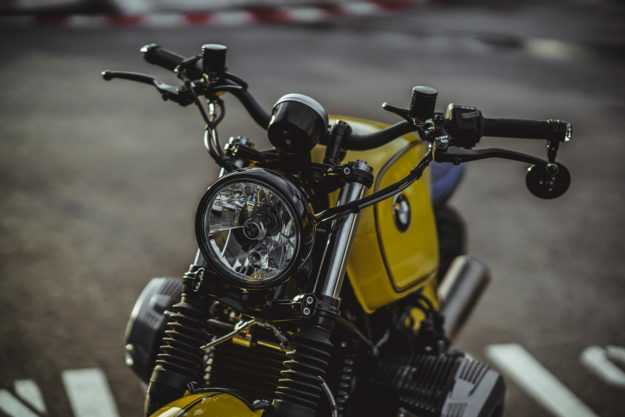 Now they’ve reworked the BMW R nineT Scrambler, with equally spectacular results. We loved the Scrambler for its playful nature when we first rode it, but NCT have just cranked the good times up to eleven. ‘Gelber [Yellow] Baron’ is the third ‘in-house’ project in a row for the Feldkirchen trio of David Widmann, Kurt Kosjek and Manuel Tilke. When they brought it home, it had less than a mile on the clock—but looking at it now, those miles are bound to rack up fast. So rebuild the rear they did—looping it off and capping it with a svelte new perch. A partner company handled the striking blue upholstery: a combination of leather on the sides, and a grippier fabric up top. There’s even more visual trickery going on up front. 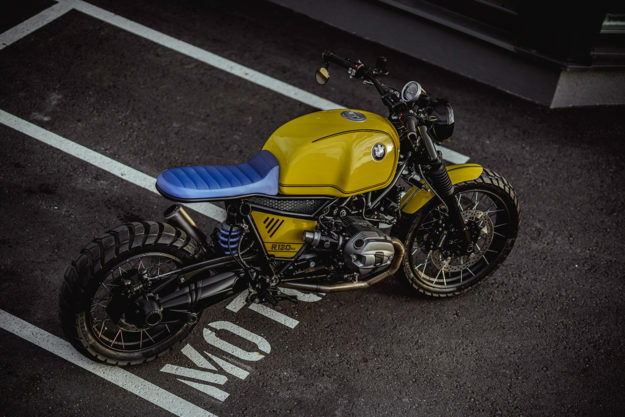 NCT wanted to give the nineT more of a vintage look, so they retrofitted the fuel tank from a classic BMW R100 RS. 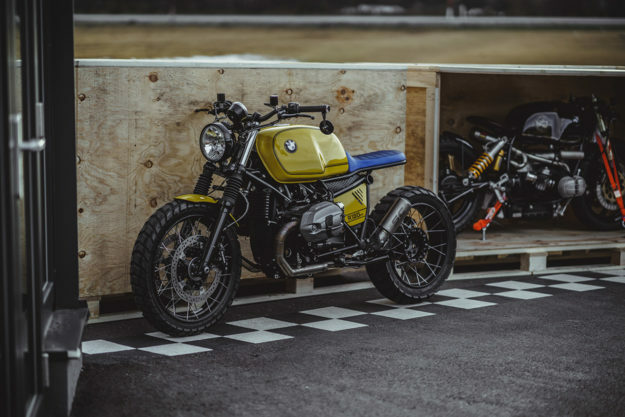 Not only did they need to get the tank and frame to play nice, but they also had to incorporate the modern Beemer’s internal fuel pump too. Moving lower down, the guys removed the Scrambler’s airbox, opting for hand-made filter housings instead. They then closed off the frame with custom-made side covers—reminiscent of those on classic airheads—and mesh inserts. The BMW is blessed with an array of good-looking OEM bits, so NCT opted to leave some of these in place. The handlebars, headlight and front fender are all original—but they’ve been repainted, along with the triple clamps and risers. The neat single dial is also stock—but the brake and hydraulic clutch controls were swapped for complete units from Magura. Motogadget supplied the bar-end turn signals and mirror. Out back, the crew fabricated a swing arm-mounted bracket to hold the license plate and an LED tail light. 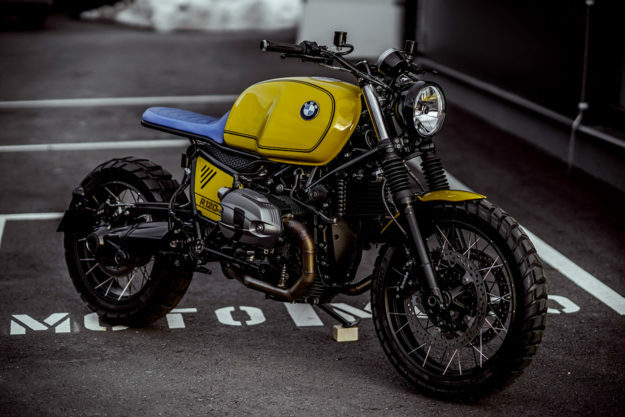 Out the box, the Scrambler comes fitted with cast alloy wheels—but this one’s sporting BMW’s factory-fitted, spoked-yet-tubeless numbers, with Metzeler Karoo 3 tires. 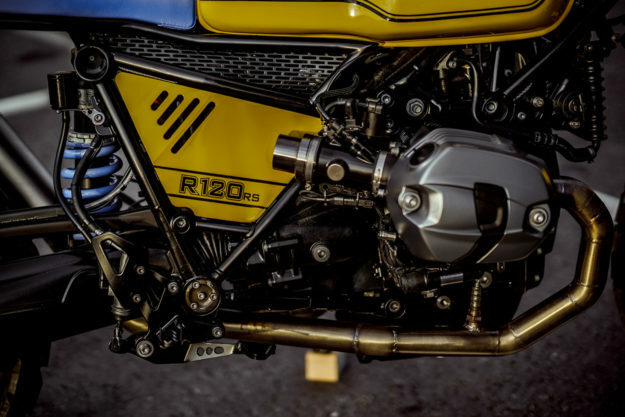 It also usually comes with sweet sounding, dual Akrapovič silencers, but NCT opted for something more unique—a low-slung muffler from MotoGP suppliers SC Project. Manuel handled the final paint, shooting the bike in yellow, with a period-correct pinstripe. We love the throwback vibe, and details like the matching blue coil on the rear shock. 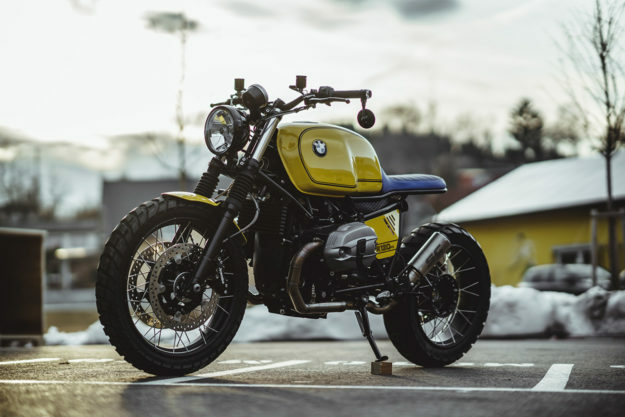 From the wacky yet inspired color choice, to the compact proportions and clever nods to the past, ‘Gelber Baron’ is one of the most perfect street scramblers we’ve ever seen. How can they fail with passion like that?